Does the idea of going live in front of the camera leave you feeling frozen? Yes, you know that doing things like Facebook and Instagram Live can be great for your marketing efforts, but you feel awkward being on camera, you don’t know what to talk about, and then the fact that you’re LIVE and can’t click the stop or pause button? Listen, I 100 percent understand that putting yourself out there via live video can feel scary, but if you were brave enough to venture out on your own as a solo aesthetician or spa owner, you’re brave enough to sharpen your camera-ready skills. Thankfully, with tips from experts like Tiffany Lee Bymaster aka Coach Glitter in your back pocket, you can build your on-camera confidence to begin leveraging the power of live streaming. 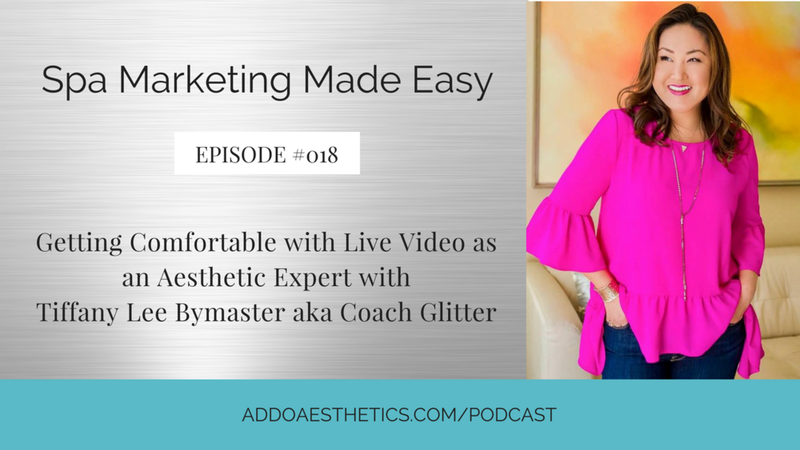 In case you haven’t guessed by now, Coach Glitter is my guest on this episode of Spa Marketing Made Easy, and she’s here to give you the honest-to-goodness truth: you can’t afford to not connect with your audience via video. In case you’re still on the fence, according to a study conducted by HubSpot, 72% of respondents said that where both video and text are available on the same page, they would rather use video to learn about a product or service. If that’s not enough reason for you to embrace video marketing for your services, I don’t know what is. So, if you're ready to get on board with today's most effective social media strategy, listen in as I discuss Coach Glitter's unique background as a pro makeup artist and how she became a live video expert, plus how to use these tools to boost your aesthetic expertise and grow your audience. Learn more about Tiffany and her work as a camera confidence coach, branding expert and pro makeup artist. Check out Coach Glitter’s course, Lights Camera Branding! Connect with Tiffany aka Coach Glitter on Facebook, Instagram and Pinterest. Ask your live video questions, receive feedback and support in the Aestheticians Connect Facebook group. Help us reach and measure our goal of impacting the lives and careers of 500 aestheticians by subscribing to Spa Marketing Made Easy and leaving us a review on iTunes!